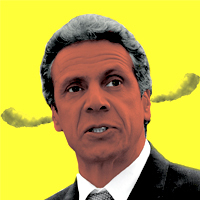 Our esteemed Governor, Andrew Cuomo, says he doesn't wish to get in the middle of a conflict between the UFT and the DOE. After all, why should he bother helping out the largest school district not only in the state, but also the country? If that darn Mayor Bloomberg thinks every principal's judgment is infallible, who is he to question? After all, Mayor Bloomberg has all that money, so he must know something. So, aside from blaming teachers for declining to accept a baseless, untested system that would likely cause us to be fired for no reason, our fearless leader is remaining absolutely neutral. Instead, Governor Cuomo is going to start a commission. He's going to study the problem, and, of course, respect the findings of his commission. He'll get people who know everything about education, like Bill Gates, Eli Broad, and the Wal-Mart family. And then he'll consult with real teachers, like Gates-funded E$E (okay, ex-teachers, but you get the point). The commission will get great fanfare as they study the problem. Perhaps they'll be on Oprah with Arne Duncan, where they'll seriously discuss the plight of urban children, and how it doesn't matter if they're in classes of 200 as long as they have great teachers. Perhaps Bill Gates himself will come and explain his brilliant notion of making DVDs of great teachers and using the discs instead of the actual teachers. Sure, there won't be as much give and take as there would be with a live teacher, but you can't have everything. I've absolute faith in this governor and I know precisely where his loyalties lie. He'll do right by those folks who supported him. Knowing that, it's almost enough to make me regret not having voted for him. But it's not quite enough. I will never vote for another politician who targets teachers, unions, or working people. I don't care what political party they claim to be part of.